LittleEllieMae: LittleEllieMae falling head over (ice cream style!) heels in love with Fanny Crown! LittleEllieMae falling head over (ice cream style!) heels in love with Fanny Crown! Amy got in touch with me and told me about the blogger contest Fanny Crown were holding. So that's what I'm taking part in today! 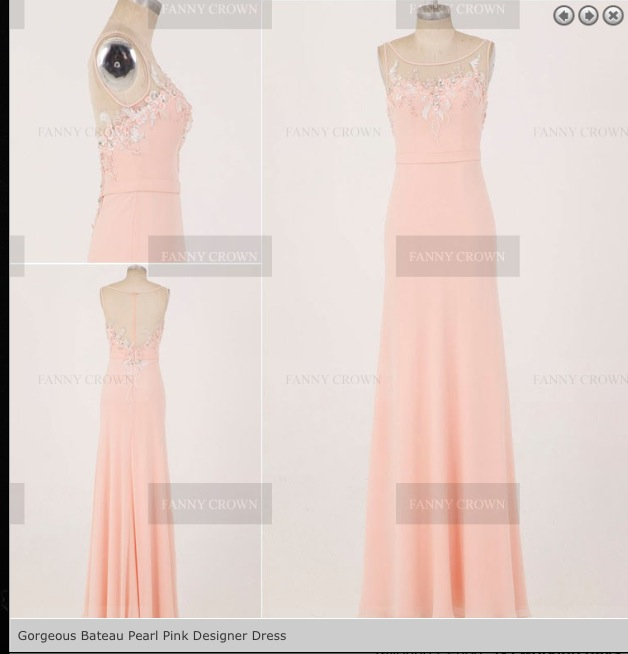 Fanny Crown Paris are an online store that caters for debs, prom, party and wedding dresses and you can find them over at http://www.fannycrown.com/. As I have my prom coming up, I've been spending an awful lot of my time browsing online stores for dresses and I can hands down say that Fanny Crown is one of the best- with such a variation of beautiful dresses for so many different occasions! I have chosen the Fine Bateau Long Pearl Pink Evening Dress to write about today, you can find it over on their website here: http://www.fannycrown.com/fine-bateau-long-pearl-pink-evening-dresses.html. This is the gorgeous dress! I adore the colour and the fine detailing around the neckline and back- it is super cute and very elegant! I would definitely wear this to a big event such as prom or a ball! You can't beat the simple elegance of a dress like this! Its a one of a kind, and very special. First up, if I were to wear this dress to prom I would pair it with girly and dainty accessories. For prom, I definitely think that its good to look healthy and beaming and I think that this dress would look gorgeous with a tan, it would compliment it gorgeously! Also I think that a good highlighter like Benefit's High Beam would give you that extra special glow on the big day. I would wear rose gold jewelry which would add some glam to the outfit and definitely compliment the amazing baby pink colour of the dress. Also I have included a peach clutch from YSL which would look very sophisticated at prom- which suits my style perfectly! A pink lipstick and simple french manicure would finish this outfit off amazingly well. I think that this dress could easily be used for red carpet occasion too! I think that you could definitely add a rock 'n' roll vibe to this elegant dress for a special occasion too! By adding a leather jacket and rolling the sleeves up for a more casual look and some killer black and pink heels, this dress would be the eye catcher of any event! By mixing the girly feel from the pink dress, nails and lips with a rocky themed biker jacket and heavy black eyeliner, it would be such an interesting outfit. Also the crystal clutch bag adds the essential bit of glam. The last look that I have put together is perfect for an event such as a presentation or summer wedding. This has to be my absolute favourite look of all three! 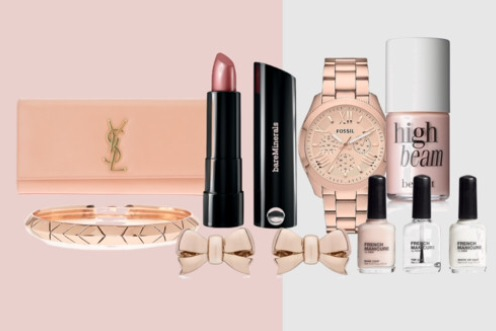 The baby pink colour of the dress would match beautifully with other pastel coloured accessories. The pastel coloured jeweled earrings would suit the glam dress very well but I have added a fun twist with these amazing ice cream style heels and flower crown- perfect for a summers day! By adding the colourful nail polish and eye makeup to the outfit gives it that special yet playful POP! I also think that this pastel bag would fit this outfit very well- making it look a bit more casual too, so it is suitable for lots of occasions. 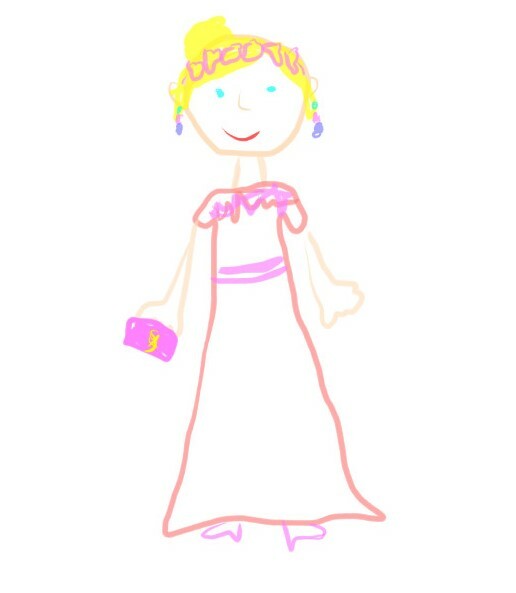 Here's a little computer drawing that I did of me in the dress hahaha! So that's it! I really hope that you like my ideas for styling this gorgeous dress! Make sure that you check out Fanny Crown Paris, here.